VP-94 has made several contributions to the tactics of anti-submarine warfare. At the time the squadron was commissioned, very little was known of the characteristics of the enemy U-boats and the propensities of aircraft in the war against them. As a result, airplanes were bombing oil slicks and air bubbles. As the picture became clearer however, the early mistakes were rapidly rectified and the submarine was put on the defensive. 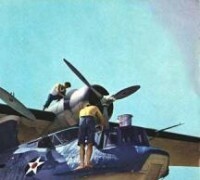 Shortly before it completed its tour of duty in the States, the squadron submitted a tentative anti-submarine doctrine for aircraft to the Commander Fleet Air Wings Atlantic Fleet. The gambit theory of luring a submerged submarine to the surface was especially noted and the squadron commander requested that all Army and Navy anti-submarine aircraft be made familiar with it. Further attention was paid to the use of radar and a request made for clarification of radar intercept by the enemy raiders. This tentative doctrine gave way to the VP-94 anti-submarine warfare doctrine in May 1943. It paid particular attention to radar use, methods of bombing a submerged submarine and evasion of anti-aircraft fire. Strict adherence to its principles where possible enabled the squadron to make the attacks of July 1943. Patrol Squadron 94 followed the normal pattern of organization throughout its career, with the only major change brought about by the introduction of headquarters squadrons into the Naval aviation organization. From the outset, Flight, Navigation, Engineering, Communications, Personnel, Training, Gunnery, Operations, Welfare and Recreation, and Buildings and Grounds Departments have been maintained. Formerly there were two other departments, Structures and Materiel, which concerned themselves with maintenance and supply matters. When Hedrons were organized these departments began to lose their identity and were absorbed by Engineering. In the first eight months history of the organization, the squadron was complete unto itself. Attached to it were all kinds of service personnel equipped to care for all but the major mechanical overhauls of the aircraft. As a result, squadron movements were unwieldy. About October 1942, when Jacksonville was administrative headquarters these extra personnel were being detached to a new supporting command, Headquarters Squadron. By March of 1944, a new unit was realized with the establishment of the ASG (Aircraft Service Groups). These men were placed under temporary duty orders to the Squadron from the Hedron organization to assist VP-94 personnel in line maintenance and periodic checks up to the 240 hour check. The complement of non-flying offecers and enlisted men has varied almost from month to month. Non-flying officers of the former classification A-(V) S, D-(V) S and C-(V) S have been attached at various times, with A-(V) S in the majority Their work has been centered in such departments as Personnel, Operations, Gunnery, Communications and Training. Administrative detail has been handled by these officers as well. The squadron had had an ACIO as part of its complement since January of 1943, concerned primarily with Operations and Tactics and with such additional duties as voting and Squadron History. In its first months of operation VP-94 included among its enlisted personnel mess attendants, pharmacist mates, storekeepers, metal smiths, electricians and boatswains in addition to the aviation rates. These were all incorporated into the Hedron organization so that today the yeomen attached to the squadron are the only ones who do not fly as part of their duties. The plane was last heard from 10 minutes after takeoff, checking communications with base radio. No further report was expected from the aircraft except for the convoy position report as of 0800 Peter 29 November. This was not received, but as at times a crowded circuit, radio failure or local static might prevent contact, no particular significance was attached to this departure from the routine. The plane was expected back by 0900 Peter and when this time passed, plans were formulated to start search at 1200 Peter, the absolute limit of endurance of 94-P10. The U.S. Army, Brazilian authorities, the Naval Observer, bases up and down the coast and outlying Brazilian towns in the Belem Area were alerted and an intensive day and night search was commenced. On 3 December at 0830 Peter, 130-B-7 sighted a wing tip float at 00-30 South, 48-30 West. 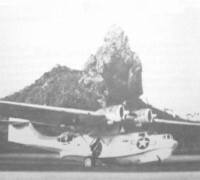 A lightened PBY5A was sent to this position, but due to rough water was unable to taxi near the beach. A boat reached the spot 24 hours after the float was first seen. The float was recovered, along with other wreckage which included parts of the navigation table, camera box, radio tubes, pilot’s seat cushions and life raft paddles. These were scattered over a three mile strip of beach. 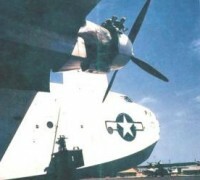 From the appearance of the recovered wing tip float (starboard), it appeared fairly certain that the float was not in the up position at the time of impact. The float locking pin socket showed not signs of mutilation, which no doubt would be the case if the float had been up. This led to the conclusion that the pilot was attempting a forced landing. From other appearances of the float there were indications that the plane entered the water with the right wing low at a speed well over that necessary to keep the plane airborne. After 4 December all searches but beach searches were discontinued. Earlier the same year, June 1943, VP-94 lost an aircraft during a forced instrument landing at night when the pilots did not know if they were over land or water, yet all aboard survived and injuries were few and inconsequential. 94-P-5 with Lt. (jg) Donald M. Faulkner, USNR, 112 146, as patrol plane commander, Lt. (jg) John T. Cline, USNR 114 446, as co-pilot and Ens. Herbert J. Greenberg, USNR 124 870, as navigator had commenced covering a southbound convoy from Amapa. At 0400 Peter 3 June 19 43 the planed departed Sao Luiz to recommence coverage at a point 200 miles east-northeast of the field. The plane was 45 minutes out of Sao Luiz, heading across the jungle and just out of the overcast at 900 feet when the starboard engine commenced popping. The tower reported oil pressure going down and seconds later the engine cut out completely and could not be feathered because of the lack of oil pressure. The pilots set course for the coast, losing altitude rapidly. Depth charges were dropped and gas was jettisoned on the port side. Below all that could be seen was light and dark splotches, apparently water. The plane was brought in, in a power stall on instruments on what proved to be the side of a sand dune three miles inland. Gasoline was pouring out of the plane so it was abandoned immediately. The co-pilots safety belt was not fastened at the time of impact, so he suffered the most severe injury, a gash over one eye. Otherwise injuries were confined to bruised legs, arms and hands. In side of two hours, over 200 natives had assembled about the airplane. They offered coconuts and water to the pilots and crew, but the water had to be tactfully refused for fear of typhoid. Lt. (jg) Cline and an enlisted man set out for Miritiba, about 30 miles distant with the aid of native guides, in an effort to dispatch a telegram to headquarters at Natal. The trip was made on horseback, mule back, foot, and jangada and ended in a disappointment for the telegraph office was not in operation. The journey was resumed via jangada, up a river and down the coast to Sao Luiz. Meanwhile the gas tanks of the crashed airplane had been completely emptied except for 15 gallons, which was saved for use with the Auxiliary Power Unit (familiarly known as the put-put). Water breakers, life rafts, flashlights, and other material were salvaged. Radio communications were established after some effort and a very weak report as to position was sent to Natal. Five hours after the radio message was dispatched, another 94 plane appeared over the survivors, communicated with them by blinker and by radio and dropped a supply of food and blankets. The food was canned for the most part and promptly burst upon contact with the ground. A second 94 plane came in to investigate the crash and inquire as to means of rescue. The crew had inspected the plane and found an improperly secured oil cap come loose and that all the oil had been pumped out. 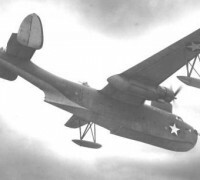 Rescue was effected on 5 June when Lt. John B. Wayne, USN landed a PBY5A on a fresh water lake about three miles from the scene of the crash. The lake had been sounded by the navigator and found to be deep enough for a safe landing and take off. Accordingly, gangs of natives were organized to haul parts of the damaged plane to the lake for transport to Natal. Six trips were made by PBY5 A of the squadron to haul out all usable equipment, including one engine, the wheels, the radio gear, etc. Detonators destroyed what was left except for the fuselage and wing. The port wing had been broken during the landing, as it trailed along the side of the sand dune. the bow was bashed in and the hull was partially sheared, laterally, at the number seven bulkhead. Ens. Greenberg found himself a second thrill, when he took off with Squadron Commander Lt. Comdr. Joseph B. Tibbets, USN, from Sao Luiz three days later. Five minutes out, a bad carburetor caused an engine failure and the plane would not hold altitude. Bombs were jettisoned before a landing was made in Sao Luiz bay. Part of the personnel was sent ashore in native boats. Lt. Comdr. Tibbets successfully took off for Sao Luiz after some his gas load had been dumped and the faulty carburetor repaired. Ens. Greenberg found it difficult to find flying companions for some length of time. VP-94 pilots have found themselves in other similar ticklish positions during their stay in South America, but the planes and the personnel have always come back.. In June 1943, soon after the detachment was sent to Santos Dumont airport at Rio De Janeiro, Lt (jg) Fred R. West, USNR, 106 354, was dispatched on a night-long anti-submarine sweep. During his incoming leg, an oil line broke in the starboard engine and 1100 RPM was the most he could get out of it. The weather was very undesirable and as the coastal area was mountainous and no navigational were available, the plane was lightened as much as possible. First to go over the side were the dirty dishes. They were followed by bombs, guns, ammunition, drift sights... in fact, everything movable that could be spared. The plane approached the coast and circled until first light, when a successful landing was made at Santo Dumont airport. On 2 March 1944, 94-P-15 became stranded on the beach near Macau on the Northeastern coast of Brazil after running out of gas when Fernando Noronha was missed on the return leg of a long hop as a result of a compass error. Lt. James K. Buckwalter, USNR 113 065, and Ens. Charles T. Bauer, USNR, 250 964, made an excellent night landing on the water and then taxied up on the beach. A blimp stationed at Fortaleza was alerted and took off with four drums of gasoline each containing 50 gallons. It arrived over the stranded PBY5A at 1230 Peter 3 March.